For more than 300 years, fishermen working in the outer Thames estuary have recovered Roman artefacts from an area known as Pudding Pan, the only sea area believed to have been named after archaeological discoveries. Numerous attempts have been, and are being, made to locate the source of the material, yet this elusive site remains undiscovered. Despite this, the stamped samian assemblage has been a central reference point for dating late 2nd century AD samian groups and thereby sites throughout the Empire over the past 100 years. The assemblage, comprising more than 600 artefacts (mostly complete plain samian vessels), has been thoroughly re-assessed to determine the nature and location of the site. Samian, transported in huge quantities throughout the Empire, is one of the key indicators of the widespread cultural reception of Rome. The assemblage appears to represent part of a cargo from a Roman trading ship, either jettisoned or wrecked en route from France to Britain between AD 180 and 200. This site-type is extremely rare throughout the Roman Empire and its discovery could contribute a new perspective on the organisation of trade. Find out more on Friday April 26th at 6.30pm at our talk, to be held at the Junior School, King’s Road, Herne Bay. Seventy-five years ago, this year Herne Bay was at the centre of preparations for one of the most dramatic operations of WWII. The first hint came on 11th April 1943, when the coast from Margate to Herne Bay was declared a restricted area and sealed off by police. Only those authorised by the Director of Boom Defence were allowed in of which two were a comparatively unknown aircraft designer, Barnes Wallis, and a much decorated bomber pilot Wing Commander Guy Gibson. Sharp-eyed and sharp-eared local residents would have been aware of some new sounds and unfamiliar shaped aircraft flying from Manston and repeatedly making runs at low level out at sea from Minis Bay to Reculver. These were the converted mosquito, Wellington and Lancaster bombers that were taking part in the final trials of the remarkable weapon, which came to be known as the ‘Bouncing Bomb’. As the prospect of the Second World War loomed, the British Air Ministry had identified the dams of Germany’s heavily industrialised Ruhr Valley as key strategic targets supplying drinking water, hydro-electric power and water for steel-making and the canal transport system. No aircraft of the time was capable of carrying a bomb big enough to destroy a major dam but a smaller explosive charge might work if it could be exploded directly against the dam wall below the surface of the water. The challenge was that the major German dams were protected by heavy torpedo nets stretched across the reservoirs to prevent just such an attack. Barnes Wallis came up with a plan to overcome the obstacle of the nets with a drum-shaped bomb spinning backwards and dropped at exactly the right low altitude, at the correct speed and release point which would bounce across the surface of the water and over the nets before reaching the dam wall. The spin would run the bomb down the side of the dam to its underwater base where a specially designed fuse would explode it. Few of the top brass in the Air Ministry had any confidence that Wallis’s idea would work but he persevered and finally won approval for the trials of his ‘Bouncing Bomb’ that took place just along the coast from Herne Bay. The trials lasted from April 9th 1943 until the final trial with the only ‘live’ bomb to be dropped in the trials on May 13th 1943 and a safety drop of an unfused one on May 15th. These two tests were 5 miles off Broadstairs. All the others were off Reculver and were of inert concrete filled ‘bombs’. The trials were a resounding success and, on May 16th, Squadron 617, the famous and courageous DamBusters, took off on their history-making raid that breached the Mohne and Eder dams and damaged the Sorpe dam causing considerable damage to Germany’s war-making capacity but from which many were not to return. To commemorate the anniversary of these events, and to chronicle a story of ingenuity, of overcoming difficulties in a very short time and the courage of those who pressed home an attack with the realisation that many of them would not return, the SEASIDE MUSEUM, Herne Bay, is putting on a DamBusters exhibition. In addition to many pictures and videos, visitors will be greeted with the unmistakable roar of those mighty Merlin engines that we have heard at so many flypasts in Herne Bay. There will be examples of the ingenious bomb-sights and the height adjustment lights that people will be able to try out and test how they would have done if they had been the pilots or bomb-aimers. There will also be two evening talks. The first will be on April 23rd, by Peter Rix from the Barnes Wallis Foundation who will show some little seen film and tell us of the work of that engineering genius, Barnes Wallis, who designed far more than the Bouncing Bomb. The second on May 14th, will be given by one of the museum volunteer team who put the exhibition together and which will fill in more detail than the exhibition has room for. It will cover local connections and the bravery of those concerned in Operation Chastise, as the Dam Busters Raid was officially known. The exhibition opens on March 24th and ends on May 19th 2018. The museum is open Tuesday- Sunday 11.00 am to 4.00 pm. There is ample parking along the Sea Front and in nearby carparks. Here’s one I found earlier! A chance to learn about fossils found in the area on previous occasions. 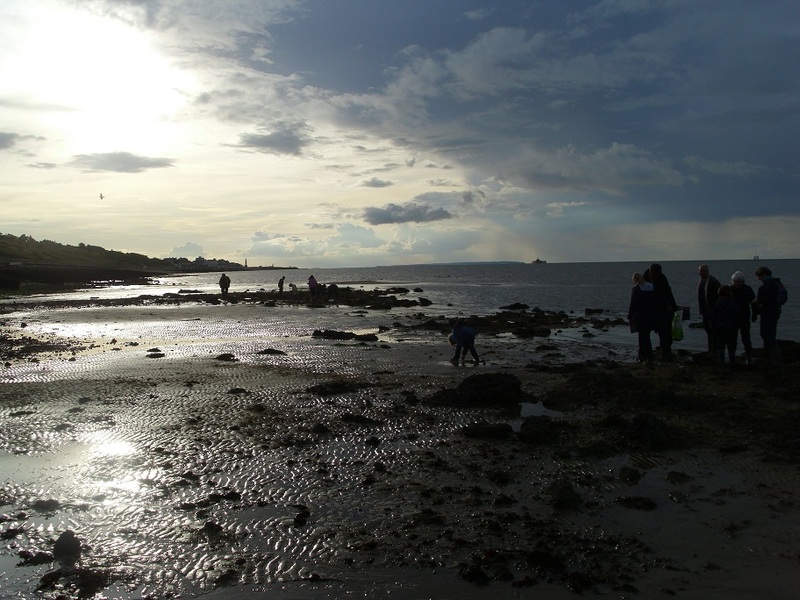 During Bayfest this summer, one very popular event was a fossil walk. 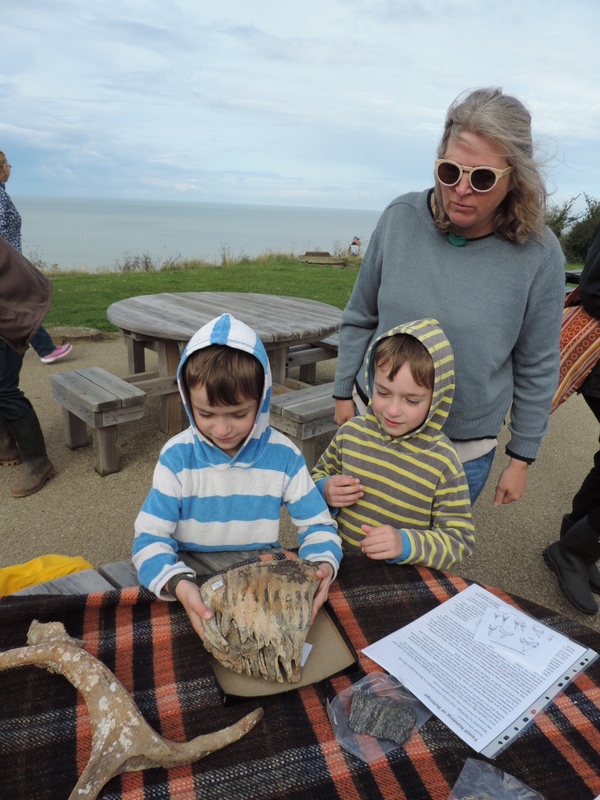 Due to popular demand, on Sunday we held our second fossil walk – children and adults met to learn from Phil Hadland about fossils in the area and how to find them. This included a chance to study items like the elephant’s tooth found in the area near the pier. After learning about what to look for, and the best way to find interesting items, they headed down to the shore to have their own hunt, complete with sieves, tweezers and other essential pieces of equipment. And wellies. Definitely wellies. 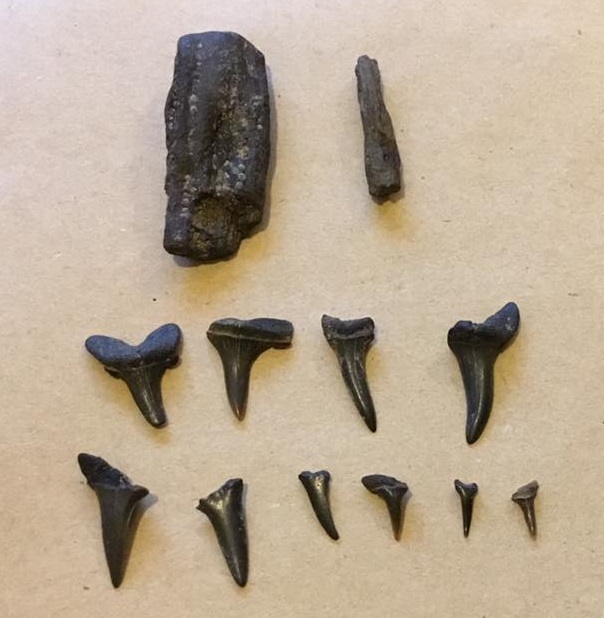 Just some of the finds from the latest walk – sharks’ teeth and fossilised wood. These walks have proved immensely popular, and we’ve received several requests for more. We are limited by tide times and expert availability, but watch this space for more information on any future events planned. Don’t forget, there is further information about the town at the Seaside Museum, including fossils on display. Heron Angling Society, The Herne Bay Angling Association and Greenhill Sea Angling Club have come together to put on a fascinating exhibition on the history of sea angling in the town. Exhibits include vintage and classic outboard motors, fishing equipment, memorabilia and photographs. 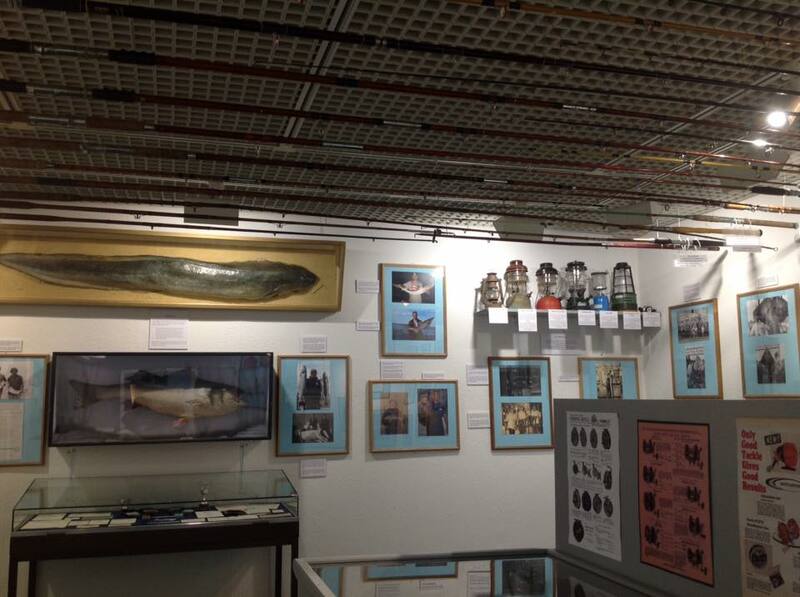 The gallery gives an insight into over 100 years of sea angling and some of the local people who established the clubs and traditions. The exhibition opens on 16th September and runs until Sunday November 12th. The Seaside Museum Herne Bay is open Tuesday to Sunday, 11am to 4pm. An accompanying talk is planned for Monday 9th October, The One That Got Away, by Kevin Morris. This will be held at the museum at 6.30 for a 7pm start. Tickets for the talk are available from the museum. Our next exhibition, opening 16th September will be Tight Lines – A dip into the history of Herne Bay’s Sea Angling Clubs, in association with Heron Angling Society, the Herne Bay Angling Association and Greenhill Sea Angling Club. Exhibits include vintage and classic outboard motors, fishing equipment, memorabilia, photographs and much more! Did you know where else the bouncing bombs were tested during the Second World War? It’s common knowledge that the bombs were tested off the coast of nearby Reculver, and a statue of Barnes Wallis now stands at on the downs near the King’s Hall to commemorate the connection. But as this report suggests, they were tested in Scotland as well. One of the smaller, Highball bombs is a popular attraction at the Seaside Museum, Herne Bay, and we are currently making arrangements to display the fragment of the larger Upkeep bomb that was found on Reculver beach earlier this year.